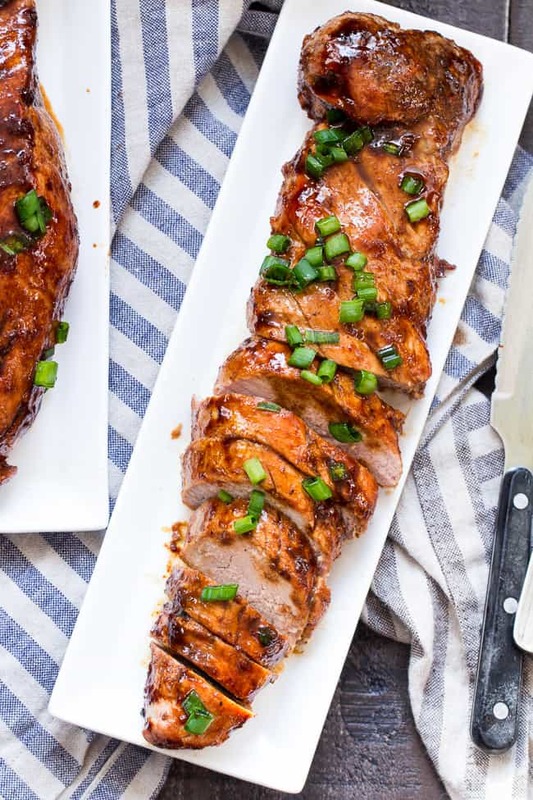 This paleo Pork Tenderloin takes just 30 minutes from start to finish and is perfect for weeknight dinners! 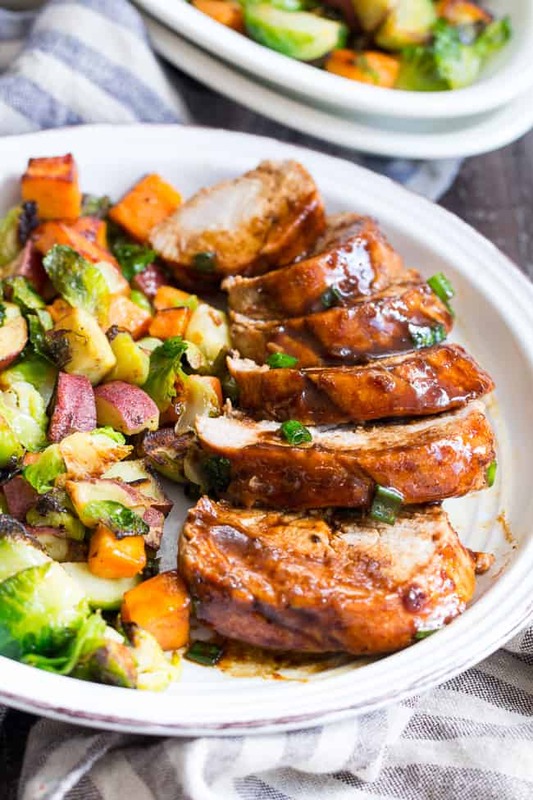 Cooked all in one pan with a Whole30 friendly teriyaki sauce that’s kid approved and goes perfectly with cauliflower rice or your favorite veggie side dish. I’m pulling myself out of a holiday cookie induced sugar coma to share a recipe you can make for an actual meal! Woohoo! In all seriousness, while I LOVE me some holiday baking this time of year, I also start to feel less than stellar when I eat cookies/coffee cake (coming soon! )/and more cookies day after day. Even paleo cookies are still, well, cookies. Anyway, I’ve been making today’s recipe for some time a couple of times per month for dinner, and it’s pretty much the only “different” meat recipe my kids don’t complain about. By “different”, I just mean it’s not a burger, meatball, or chicken cutlet 🙂 Most of the time I make this, the younger two insist it’s chicken anyway, but hey – whatever gets them to eat dinner, right?! In their defense, you could totally make this recipe with chicken breasts. Or turkey tenderloins, and probably any meat that’s about the same thickness as a pork tenderloin! The sauce is a mixture that I threw together randomly and then finally decided to actually write down the ingredients one day. 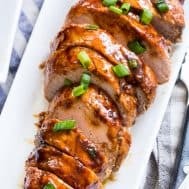 I would consider it a teriyaki flavored sauce (or so my kids decided, actually), made with all paleo ingredients, using a Whole30 compliant sweetener (dates) if needed. 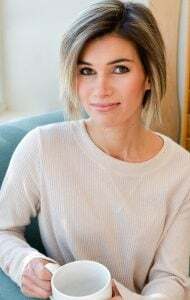 While the mustard and balsamic vinegar aren’t typically found in a teriyaki sauce, they add great flavor, and, the balsamic sweetens the sauce as it reduces to complement the dates/maple syrup. If you’re not on the Whole30, you can use pure maple syrup for your sweetener so you can whisk the sauce together in less than a minute. And, if you ARE on Whole30 and made your date paste ahead of time (go you!! ), you’re also looking at under a minute for prep time! 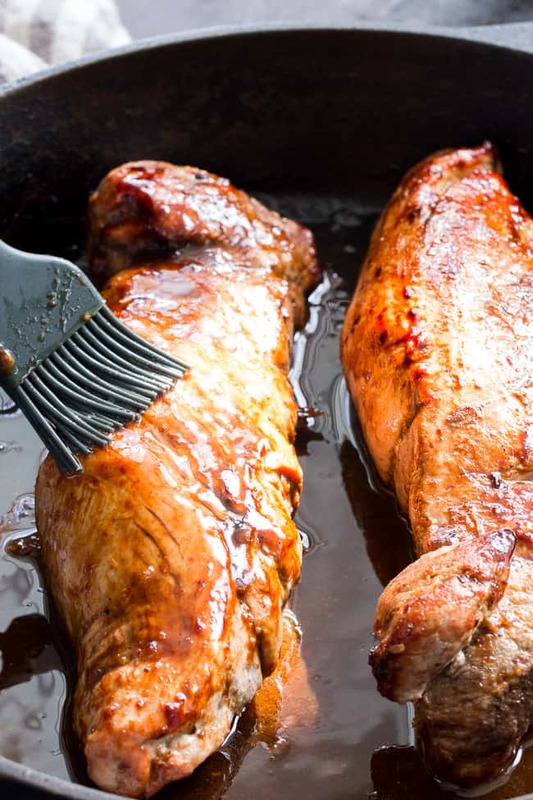 You can serve this pork tenderloin with pretty much any side dish you could imagine. I typically just serve it with roasted sweet potatoes and veggies, but if you want to go the “rice” route, cauliflower rice would be tasty! Or, if you want to get fancy, you can go the fried rice route with this recipe, minus the chicken. Go ahead and keep the bacon though because, well, it’s hard to say no to bacon! Aside from it being tasty and kid friendly, I love this recipe because it’s super quick to make – quick enough for my 30-minute weeknight requirement. As long as your tenderloins are relatively thin (most are) they should take just about 20 minutes to cook through after browning. I cooked 2, and each one was about 1.25 lbs. I also love having the leftovers for lunch the next day! 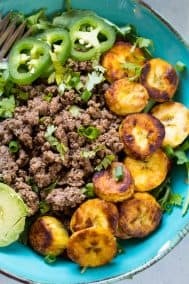 Perfect with fried plantains and whatever greens I have on hand. Okay, get out your biggest skillet – I think we’re ready to start – let’s cook! 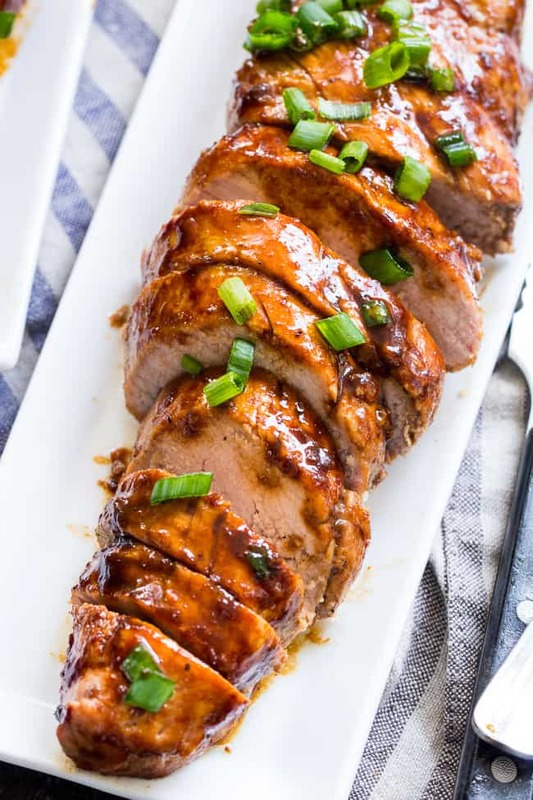 This paleo Pork Tenderloin takes just 30 minutes from start to finish and is perfect for weeknight dinners! 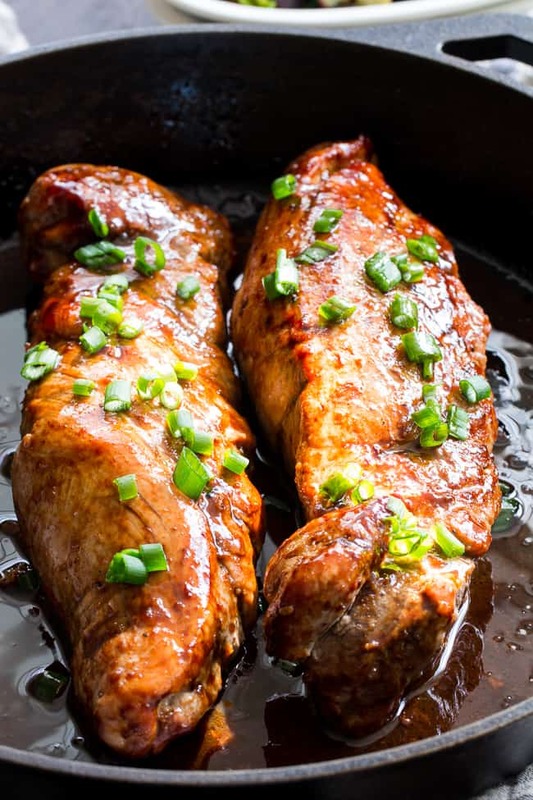 Cooked all in one pan with a Whole30 friendly teriyaki sauce that's kid approved and goes perfectly with cauliflower rice or your favorite veggie side dish. Prepare the sauce first by whisking all ingredients together in a bowl, set aside. 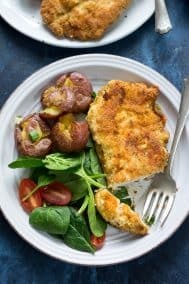 Heat a large, well seasoned, cast iron skillet to medium high heat and preheat your oven to 400 degrees F.
Trim excess fat and silver skin from tenderloins before beginning. Sprinkle tenderloins with sea salt, then coat in sauce, shaking off excess. Add 1 Tbsp oil to skillet and brown tenderloins all over, turning 2-3 times. Turn off heat, then cover tenderloins with remaining sauce and roast in the preheated oven until done - about 15-20 mins depending on thickness of your tenderloins, until internal temperature reaches 155 degrees. Brush sauce and pan juices all over tenderloins and sprinkle with sliced scallions. Allow the meat to rest for 3-5 minutes before slicing and serving. Enjoy! *To make date paste for this recipe, place about 1/4 cup pitted medjool dates in 2 Tbsp of very hot water to soften. 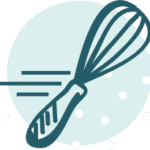 After 5 minutes you can stir to make sure they'e soft, then blend the mixture in a high speed blender or small food processor. Blend until smooth and add water if needed to get the right consistency. 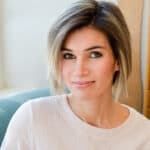 Want More Whole30 Dinner Recipes? Try One of These! Can you use date sugar in place of date paste?! I don’t have a cast iron right now. Any recommendations for transferring to the oven? I made this last night and honestly, it comes together and roasts so quickly that I personally think a slow cooker would end up actually being MORE work. Delicious! The whole family loved it. Made this tonight and it was delicious! Definitely putting it on our weekly rotation! This was so good! Used the leftovers for your fried cauliflower rice.… delicious! This looks delicious, and I’m definitely going to try it. 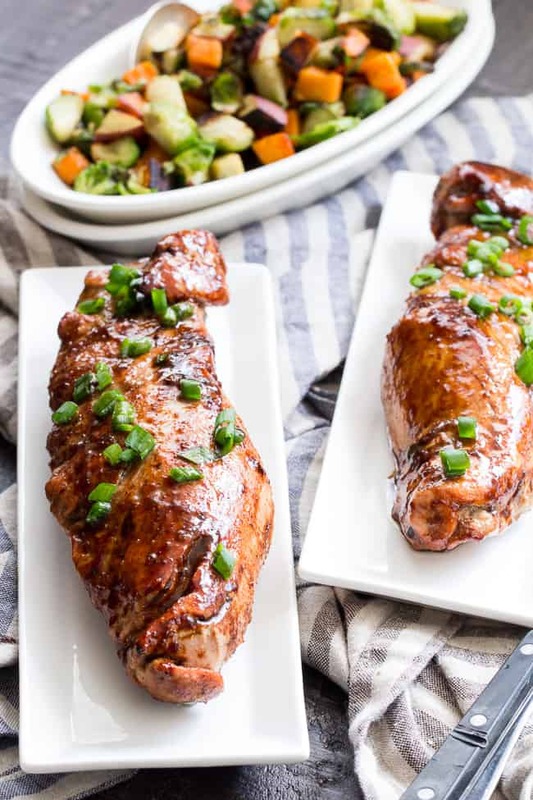 Teriyaki is one of my favorite marinades, and it’s hard finding one that’s Whole30 compliant. I’ll use the date paste rather than maple syrup, though, as the latter is not Whole30 compliant. Thanks! We just had this tonight, and OMGoodness, it was amazing! I have been looking for a good Whole30 compliant Teriyaki, and this was an all around thumbs up from my family. 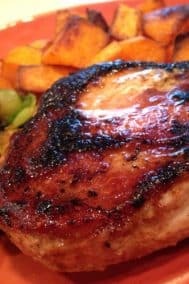 I marinated a turkey tenderloin (I love pork as well, but this time I had turkey) for 24 hours, and then threw it all in a pan with a meat thermometer and baked at 350 until the inner temp was 165. I can’t wait to try this on a pork tenderloin…and on flank steak!! Thanks!! Update: I used this teriyaki recipe with a pork tenderloin, tripling the sauce ingredients because it was a huge piece of meat, and it was SO good. My family loves this sauce, even my son who’s not a teriyaki fan. Thank you! we love to mass cook so we did 3 pork loins at once and tripled the sauce portion. It took more time to cook, also we used a glass baking dish. But it was so worth it!!! thanks for this brilliant recipe. makes the effort to home cook goodness in our lives well worth it!!! I’m thrilled you guys enjoyed it! Awesome recipe. We made it the other day and it came out perfect. An instant favorite. You shouldn’t list this as Whole30 if you list maple syrup as an ingredient option. Decidedly not Whole30 to sweeten with anything other than dates or a small amount of fruit juice. This is excellent! Has a fantastic flavor – everyone loved. I am going to make this for a few friends. It sounds wonderful! I want to marinate the pork in the sauce overnight. Is there a reason I shouldn’t? “Date Paste” ? But it was very testy. Thanks again. One of the best recipes I have made in a very long time. Amazing.